This may seem obvious, but it’s a good idea to remember what you’re dealing with. Go watch some Youtube videos of people eating these things whole. Imagine that pain not just in your mouth, but in any of your mucus membranes, or even your skin. Remind yourself not to do something as seemingly simple as rubbing your eyes while cooking with them. Now, I can hear you saying, “Big deal, I can do that. I haven’t rubbed my eyes since 1996!” And that may be true, but I’m telling you: there’s something strange that happens when you’re working with these peppers. Suddenly, your eyes will get very itchy. You will have to resist the urge to rub them, unless you want to be fitted for an eye patch like a pirate. Up to you. So how do you limit your risk? So it’s really the capsaicin on the inside of these peppers that has the heat. The flesh of the peppers is infused with some of the heat, but the interior membrane and the seeds are where the pain lives. So if you cut open the pepper, that pain will leak out and take over everything — the food, the knife you use to cut it, and the cutting board on which you cut. If you touch any of that stuff after cutting the pepper, you’re done. So our task becomes: get the heat out of the pepper without cutting it up. There are two main ways to do it: heat, and salt. Both of those things will break down the cell walls of the pepper, allowing the heat from inside to slowly seep out and infuse the food with a ton of heat, without being painful. For the purposes of this post, I am making something I call a curry-less curry. It’s a stew with a lot of the same flavor profiles of an Asian curry, but without the exotic ingredients. It’s pretty amazing how much flavor you can get out of some simple ingredients. 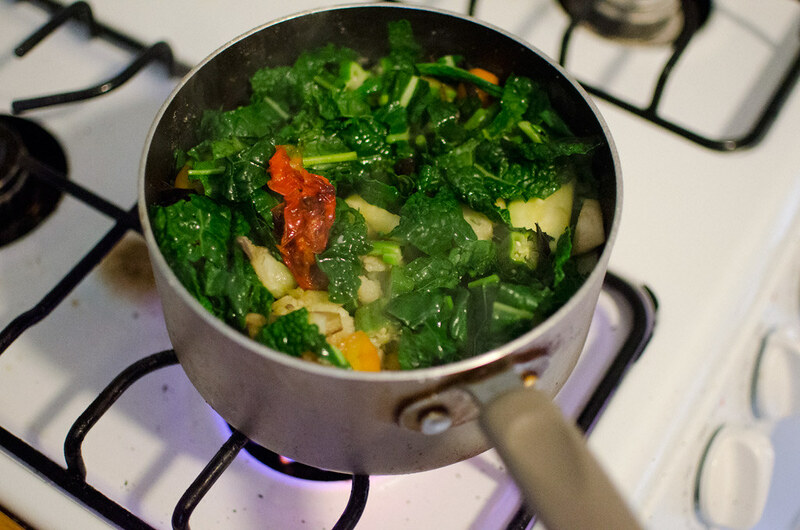 Add the pepper to a deep pot with some vegetable oil, and crank the heat. The pepper will begin to pulse and swell as it heats up — if you picture the inside of a pepper, there’s a lot of empty space in there. 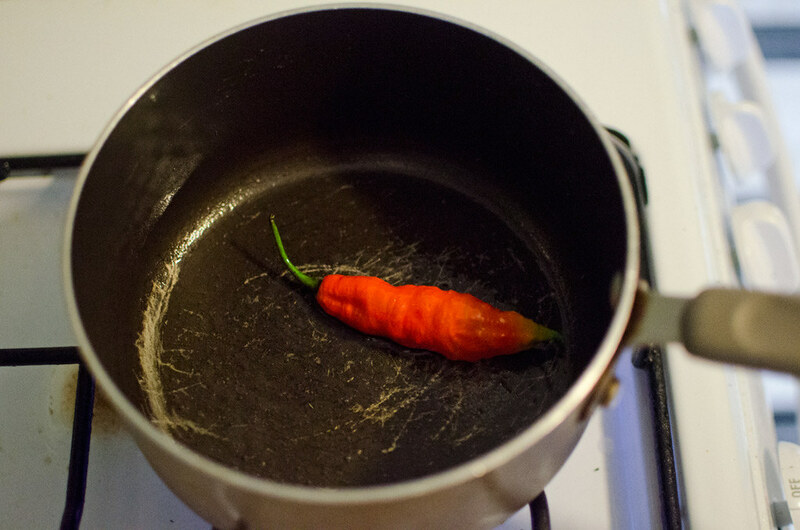 As the pepper heats up, the water in the cell walls begins to steam, and that steam gets trapped inside the pepper. That’s what causes the swelling. Turn the pepper occasionally, and you’ll see it starts to blister on the side. You’ll be able to smell it as well, an odor that’s equal parts fruit and spicy. Then you sprinkle it with some salt. 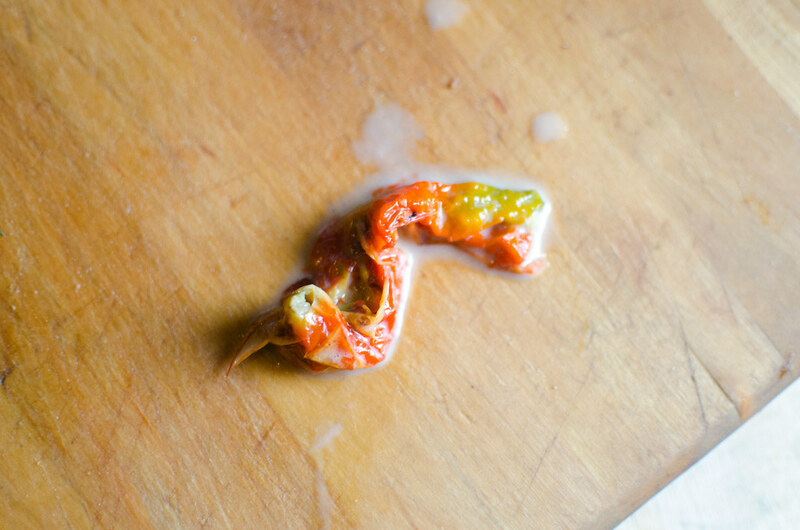 Through osmosis, the salt will draw out even more of the spicy moisture of the pepper. Then begin layering the other ingredients. It helps to have them prepared and chopped already. I started by adding some eggplant and some garlic. When the eggplant started to brown, I seasoned it with salt and then added cauliflower. Then I seasoned the cauliflower and added okra. 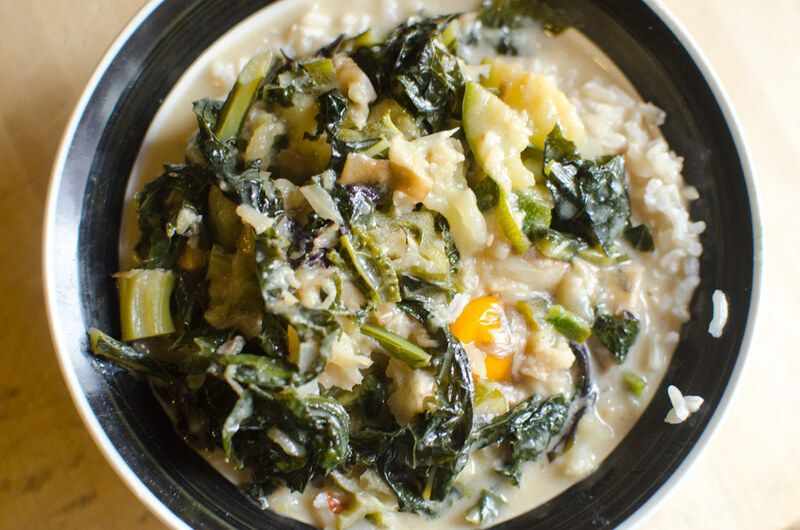 Continue in this fashion until you’ve added everything you want in your curry — I also used cherry tomatoes, zucchini and kale. You’ll be stirring up the ingredients as you go, to make sure the heat and seasonings are distributed evenly, but take care not to tear open the pepper. It will be very soft and shrunken by this point, so go easy when stirring. One of the reasons that the food of Southeast Asia is so good is that it manages to balance four main flavors: hot, sour, salty, and sweet. If you can get all four into your dish, you’re doing something right. Well we already have the hot and the salty, so now let’s add the sweet. 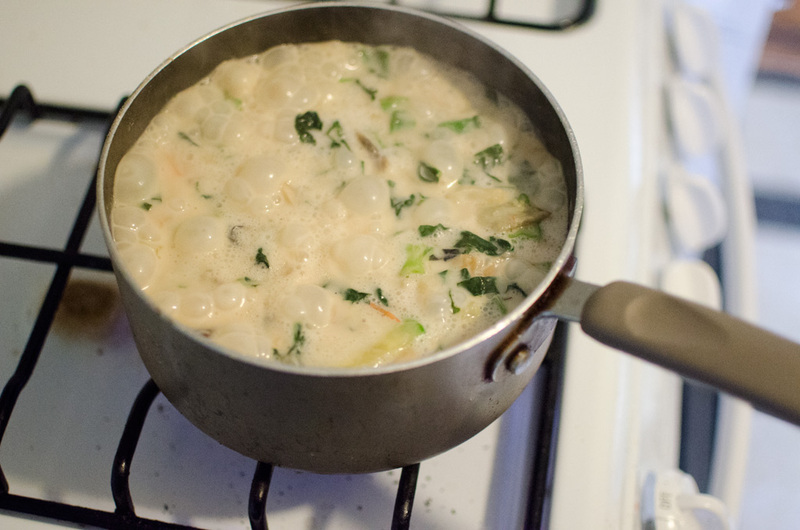 Coconut milk is the most readily available way to do this, though some dishes also call for palm sugar to be added. I just used a can of coconut milk, and then added a little water to thin it out. Stir everything around, and season it with just a little bit of soy sauce. Turn down the heat and let the mixture simmer for a bit. Add the juice of a lime (sour), and you’re just about ready. Check it for seasoning — if it needs more salt, add it. Although water would seem to be the way to dampen the heat in your mouth, I actually think rice does a much better job. According to the Straight Dope, water doesn’t work because the fiery stuff has been infused into the oil you cook with, and oil and water don’t mix. 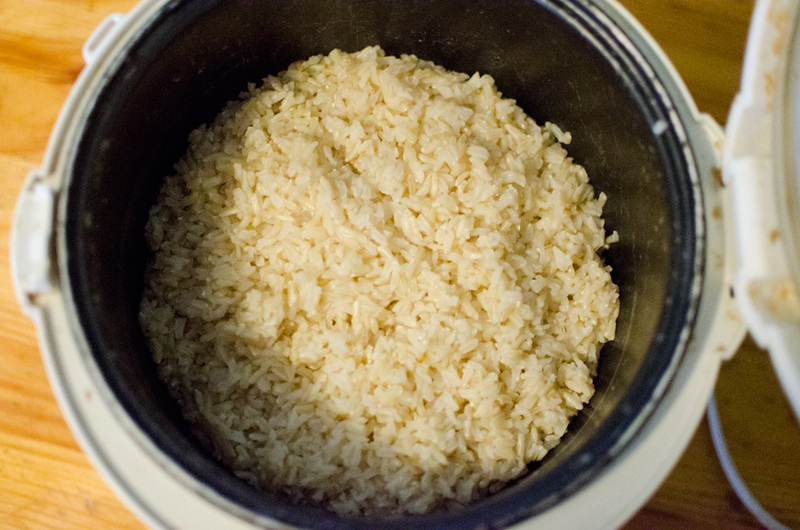 Rice (or other starches) can help soak some of that oil up, away from the insides of your mouth. Use tongs, or chopsticks, NOT your fingers. Look at how much volume that pepper has lost. Where do you think most of that ended up? In your curry-less curry, that’s where. If you like things spicier, use the tongs to give the pepper a big squeeze before removing it, just to make sure it really has released all of its goodness. Probably not a good idea to actually eat this thing. Self explanatory, really. The heat should be pervasive, but not overpowering. 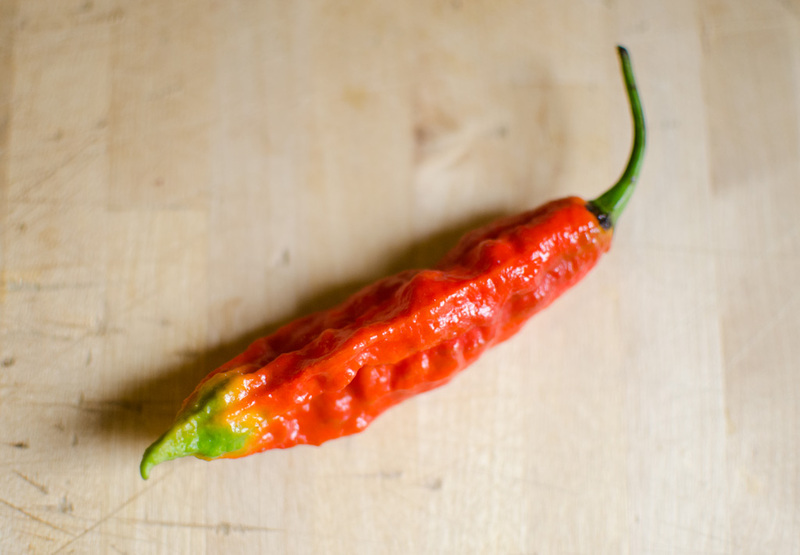 And then you can brag to your friends that you cooked with the world’s hottest pepper. Note that you can use these tips in any recipe, you don’t have to make my curry-less curry. 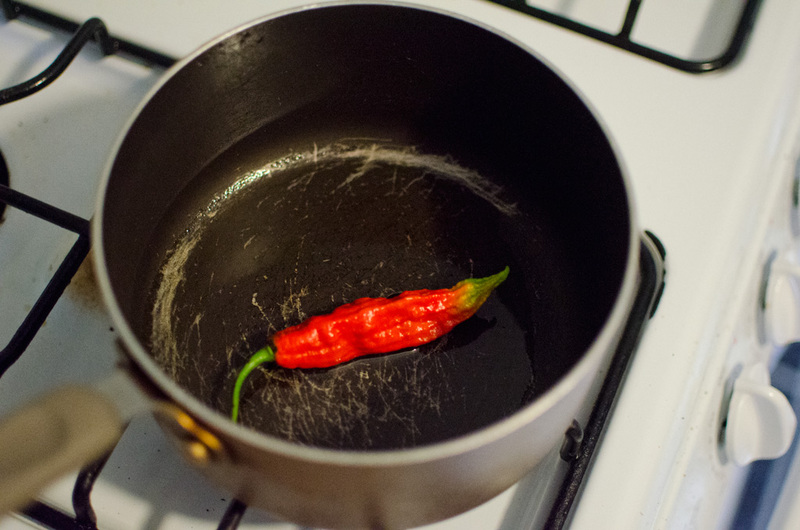 Leave the pepper whole, use heat and salt to draw the heat out of it, and remove the pepper at the end of cooking so you don’t accidentally eat it. 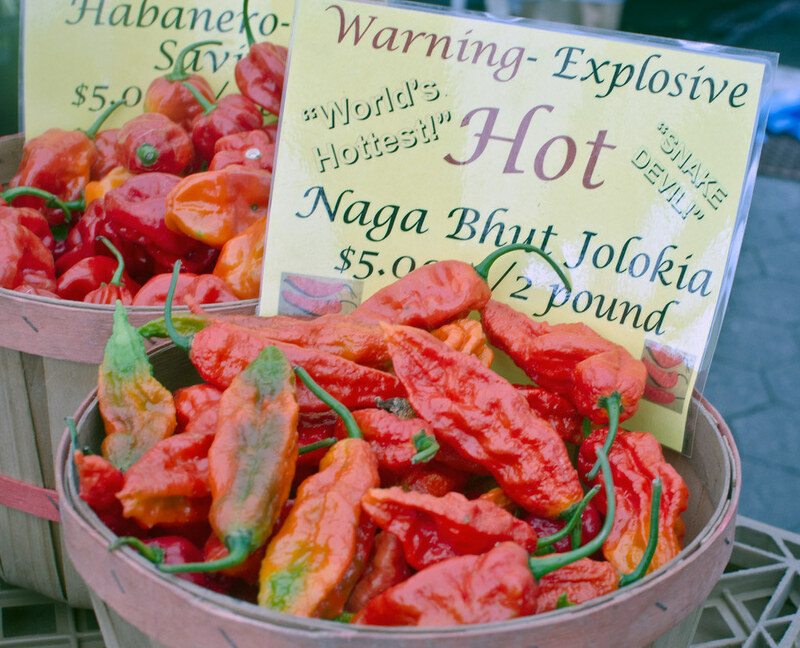 Has anyone else out there cooked with these insanely hot peppers? How do you manage the heat?